For our sixteenth Rerun we are concentrating on Happiest of Holidays with Evelin T Designs. With delightful illustrations, lovely handwritten words and corresponding sentiments there are so many possibilities for holidays cards during the autumn and winter. I stamped the scene using the birdhouses, tree limb and bird from Happiest of Holidays with Evelin T Designs in black ink and colored them in with Tim Holtz Distress Inks and water. Then I stamped the sentiment with Versamark and heat embossed it in gold. Next I over-stamped in grey and offset it a little to allow the sentiment to standout just a little more from the background. I put together the ornament and tied a piece of red string in the tag. I adhered the tag to the card front using foam dimensional adhesive. That's it from me...wait until you see what Gayatri, Heather H., Kelly and Lydia did with Happiest of Holidays with Evelin T Designs! 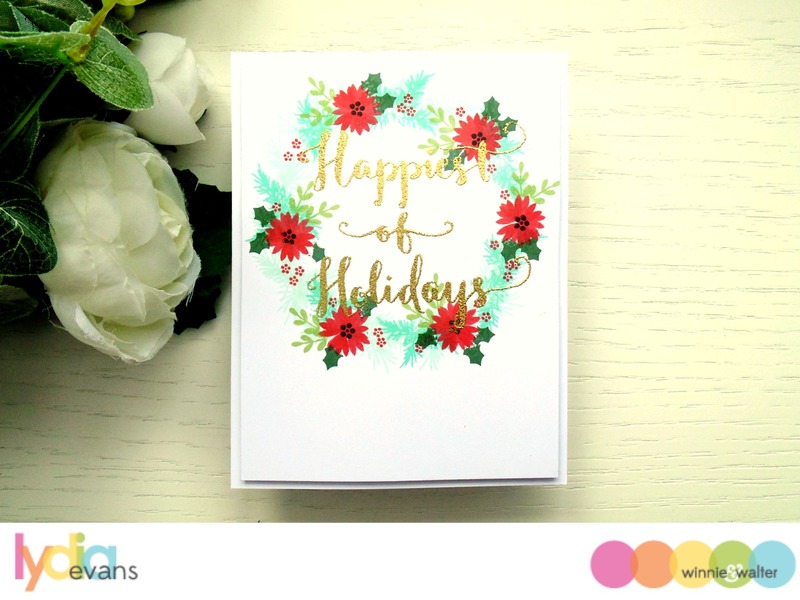 Create a new project using Happiest of Holidays with Evelin T Designs. (and/or the coordinating cut files). 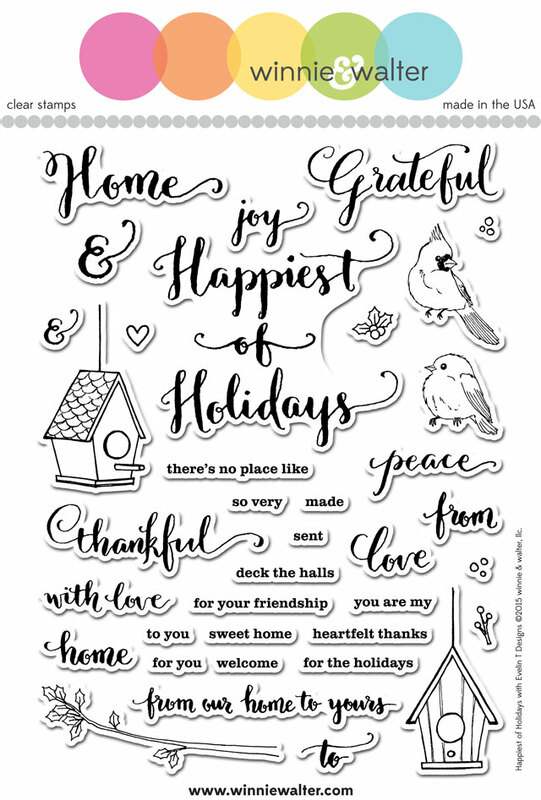 An alternative to using Happiest of Holidays with Evelin T Designs. (and/or the coordinating cut files) is to create a new project using one of the projects featured in this post (or any Rerun post throughout October by The Talent) as your inspiration. Make sure you use at least one (1) w&w product (this can include a freebie) in your project. 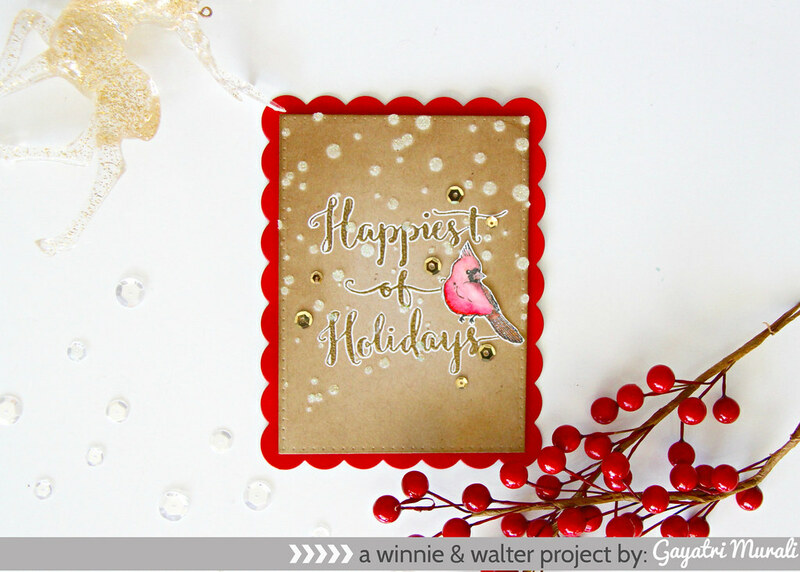 If you choose the alternative to using Happiest of Holidays with Evelin T Designs. (and/or the coordinating cut files), please include in your post or project description which project inspired you and how. Link up your project here by 11:55 p.m. CST on November 30, 2016. One project will be randomly chosen to win $25.00 credit to the w&w shop! The winner will be announced on in it's very own post on the w&w blog later in December. (The winners of Rerun No. 15 challenge and giveaway will be announced later this month). Please comment on this post (make sure to include your email address in your comment--if you have to add your email address to your comment please do so by replying to your original comment) by 11:59 p.m. CST on November 30, 2016 for a chance to win your very own Happiest of Holidays with Evelin T Designs. stamp set! Love the Happiest of Holidays stamp set. Thanks for the chance to win it! Oh my goodness--you guys have shown what a great, versatile set this is! I love that you made your little scene into an ornament, Shay, & love the large sentiment in the sweet wreath--wouldn't have thought that would work! Really love every one of these & can't wait to case you talented people! great cards! Love the inspiration! Ooooh, one of my favorite stamp sets! Such gorgeous cards, ladies!! I love this pretty Happiest of Holidays set! These cards are all so beautiful! I love the little house, and the cute birds! Great challenge and wonderful cards using this set. Really delightful set! Love the birds and their houses! Beautiful inspiration by the design team! What a darling stamp set! Watching birds at the bird feeder is one of our favourite morning pastimes. Beautiful samples! The handwritten words in this set are fabulous. I meant order the stamp set, not the card, LOL I also used another Winnie and Walter set to recreate the Happiest of Holidays Wreath card. (WW042CA In Bloom: Eva's Favorite Flowers stamps and cutaways) I made it as a birthday card though. I added a photo of my card via "inlinkz" (above). There was no where on that link to add my inspiration or the product used, so it's noted above. Love the little bird houses. I thought I had commented on this post, but I do not see it. So here I go again... 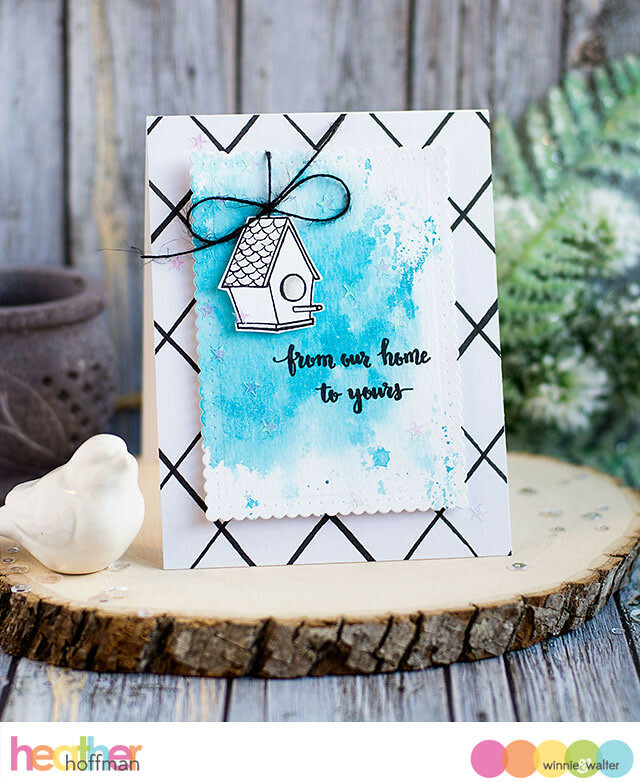 I am in love with the sweet birds and birdhouses on the cards and the cheery sentiments!! 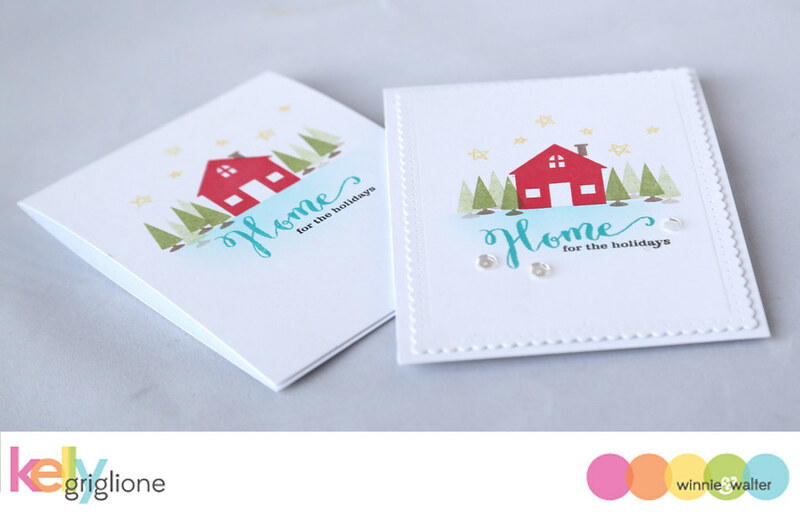 I wish I had the energy to make a card for this challenge because I am feeling ever so inspired by these adorable cards and this stamp set. 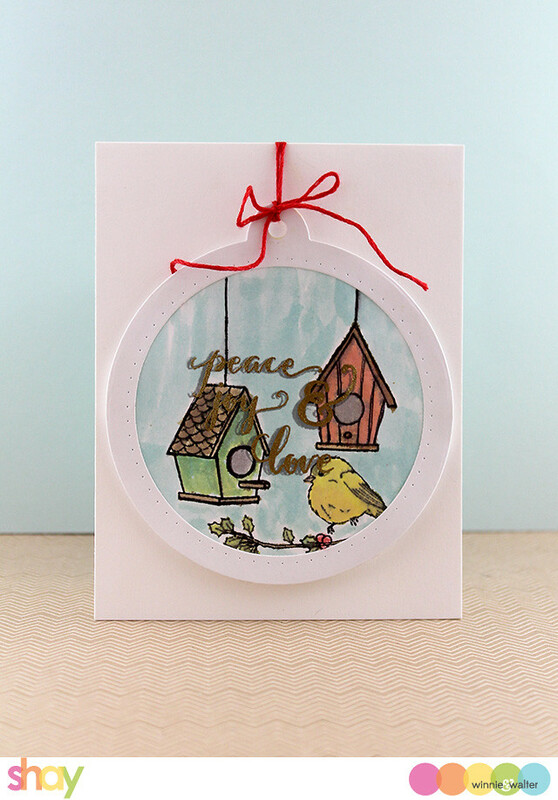 The birds and birdhouses are such a fun image to use for holiday cards!